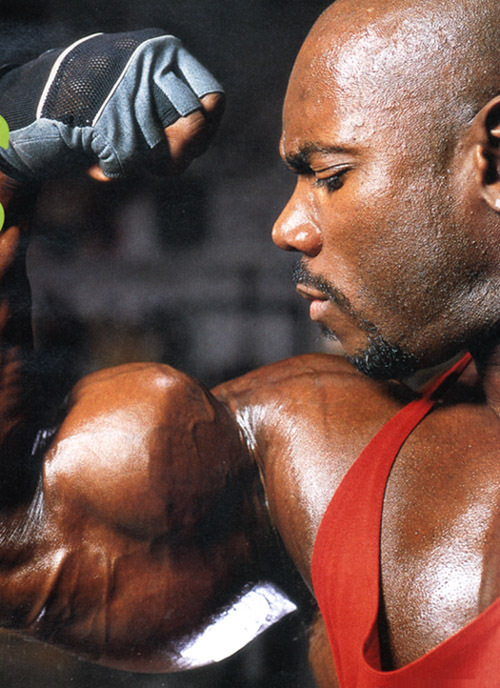 Kenneth Flex Wheeler, shown in a Weider magazine photo shoot in the 1990s. Wheeler (born 1965) has won many pro shows, including the Ironman Pro five times, and the Arnold Classic four times. He came in second three times at the Mr. Olympia (1993, 1998, and 1999). WELCOME to our website, Bodybuilding Reviews! We strive to keep track of bodybuilding achievements in the United States, along with reviews of associated media. Classic bodybuilders of the '70s, '80s, interviews, world contests: GMV Productions pics (12 reviews).